[July 27, 2009] PHILADELPHIA (AP) -- Officials at the Philadelphia Zoo say they're happy that an AWOL avian has been found and is returning to its perch. Zoo spokesman Bill Larson says a tropical bird that flew the coop two days ago was recaptured Saturday morning in the city's Fairmount Park. 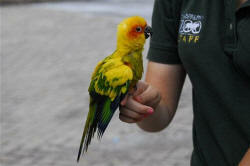 The juvenile sun conure (CON'-yer) disappeared Thursday during the Festival of Flight bird show. Larson says the zoo's animal department followed up more than 100 leads after putting out the word about bird, which is mostly yellow with a green tail.